Flat Earthers. What are they like? They just love it don’t they? ‘The MAN is lying to us’, ‘they’re covering it up’, ‘the Earth is flat’, they think perpetually before posting on their conspiracy blog or roaring it out through a megaphone at a flat Earth convention. Maybe the Earth is flat, and if it is then fair doos to them, it won’t change my life. I’ll just be like ‘woah, that was a bit weird’ and then move on. But it’s not is it? The Earth isn’t flat. It never has been and never will be. In case you wanted some proof then look no further than the selection of images below. 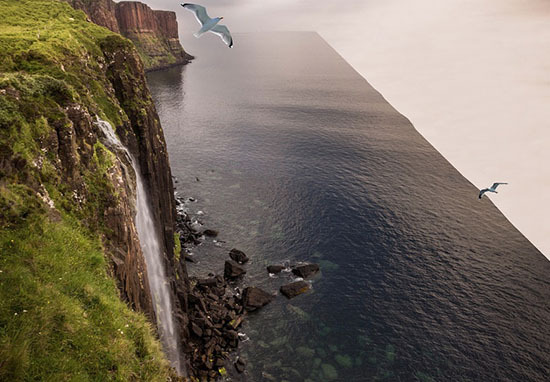 What begins as a relatively typical Instagram style photo of Lake Michigan, taken by 47-year-old Greg Pagel and posted to Imgur quickly evolves into definitive proof of the Earth’s curvature. And there we have it. Proof. At last. As if millions of intellectual articles about the Earth’s curvature, footage from outer space of the many round planets (oh but they were staged, flat Earthers are probably thinking), or even globes weren’t enough – this definitely is. So, well done Greg for presenting a fully explained theory on the matter. In case you want to hear the argument from a flat Earther’s point of view then look no further, as recently UNILAD sat down with Connor, son of famous flat-earther Dave Murphy, to talk about NASA, the Sun, Photoshop and pretty much everything you’ve ever wanted to ask someone who thinks the reason you see the curvature of Earth from a plane is because the windows are round. Connor believes the only reason many find Flat Earth conspiracies suspect is because we’re taught to do so from a very early age.